The right data, in the right place, at the right time. SAP data management initiatives must keep pace with changing business needs from an extremely competitive environment. Despite large investments in time, money and personnel, traditional techniques and solutions have been proven to be unable to extend to the enterprise scale. Join Winshuttle at the 11th Annual ASUG Data Governance Summit to learn how applying lean techniques with iterative continuous improvement will standardize and improve your SAP data management processes. 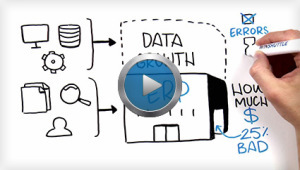 Streamline data collection, validation and movement – get control of your SAP data. In the meantime, watch the short video to find out more about Winshuttle’s Lean Data Management approach. Fill out this form and we’ll get in touch with you to schedule a meeting at the event or to send you more information.